Today's random set is 6687 Turbo Prop I, released in 1987. It's one of 24 Town sets produced that year. It contains 78 pieces and 2 minifigs, and its retail price was US$6.48/£5. It's owned by 3215 Brickset members. If you want to add it to your collection you might find it for sale at BrickLink or eBay. Ah, a beautiful Classic Town set. Good for the soul. And there’s no question how this one flies. Well, very cute. I guess they can't all be winners... Well, maybe that's why there are no more classic smiley faces. All most all of those people died in plane crashes. Is a must have to add to your city. Beautiful old Town plane sets. Good times. But seriously, his position on the box art doesn’t exactly look the safest. Before my time by several years. 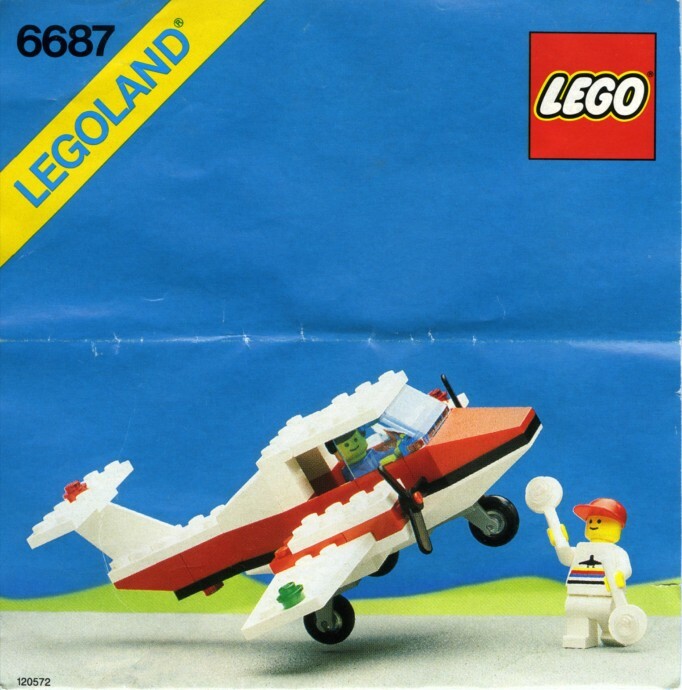 Always thought that sort of torso, the one with the plane, is awesome. I want that torso! It's beautiful. Is the plane taking off or landing? Cos if it's landing it's doing a terrible job of it. My brother and I had this set too! Lovely little plane. I hope it brings them (and your niece) the same amount of fun. I loved this set growing up! I spent hours playing with this set. Now my kids love playing with it! Classic. Had this set when I was little and it now is in my nephew's collection. Back when all of the city airplane pieces could be turned into other things without being obvious that it was a molded airplane nose or body. One of my first Lego sets and still love it to this day! Classic design with the angled slopes, small props and 4 wide, but still a good selection of parts to build other things with it as well. "Hey dude wanna play some tennis?" "I SAID, WHY ARE YOU ON A PLANE?! WE'RE PLAYING TENNIS!" One of my fondest little Town sets from childhood. I'm amazed at how great that plane was at under 100 pieces! Sill have the instruction manual for this and simply must rebuild it someday. For a small plane, it does the job well. While yes, the nose, tail, and hull can be considered specialty parts, there are relatively few compared to the huge parts like canopies used today. Even the windscreen is a standard one used on cars and trucks as well.